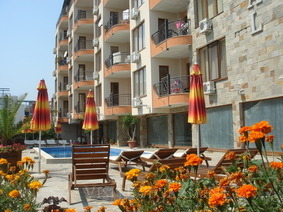 Sea Regal Aparthotel in Sunny Beach resort in Bulgaria. Extras and Early booking offer can not be combined! Location: Sea Regal Aparthotel is located right on the seafront close to the most attractive place in the resort of Sunny Beach - Cacao Beach. Accommodation: The complex offers accommodation in luxury studios, one and two bedroom apartments. All the apartments are fully furnished with air conditioning, fully equipped kitchen including a refrigerator, a balcony with table and chairs. The apartments in the complex have amazing views towards the sea, the central part of the resort, as well as St. Vlas and Elenite. Comforts in the complex: Sea Regal Aparthotel offers a pool area and lounges where guests can enjoy their summer vacation in Sunny Beach.